This is for all those on the Facebook group – Ryans and Roches of Commonealine, County Tipperary. The file is too big for Facebook. Click on the picture and you will see the chart and then zoom in. I only include information to my parents’ generation, because of privacy. Check out the other posts in this blog – I have other information on the Ryans and the Roches. One of the best places to get help on genealogical questions is a Rootsweb mailing list. There are mailing lists available for surnames, countries, states, military, and just about anything you can think of. The Tipperary mailing list is very active and I sent them a question about the meaning of the townland names and within a short time I received a response and a link to a great website: Bunachar Logainmneacha na hEireann or Placenames of Ireland. You type in the name of the townland and will see a list of townlands throughout Ireland with than name. There is often more than one townland with the same name, and in some cases, there are many. Click on the one you want and you will go to a site where you can toggle between a map and data. The data section usually has an attachment which has a list of the various spellings of the townland over the years and the meaning of the name. Commonealine Comán Laighean – little hollow of the flax (Lawrence Ryan and Johanna Roche were living here at the time of their marriage and when their daughter Maggie was born. Now if only I could figure out how to pronounce these names! I will go through the listings and post the townlands for other Colbert-Whelan families in a future post. My father knew very little about his family history. He knew his grandparents, Lawrence Ryan and Johanna Roche, were from Ireland where they were married and where their first three children, Maggie, Mike and Mamie were born. But what part of Ireland? Fortunately, Larry and Johanna Ryan were married after Ireland started civil registration and it was fairly easy to find their marriage certificate. They were married in the Chapel of Doon, County Limerick on February 2, 1875, and lived in the townland of Commonealine, County Tipperary. 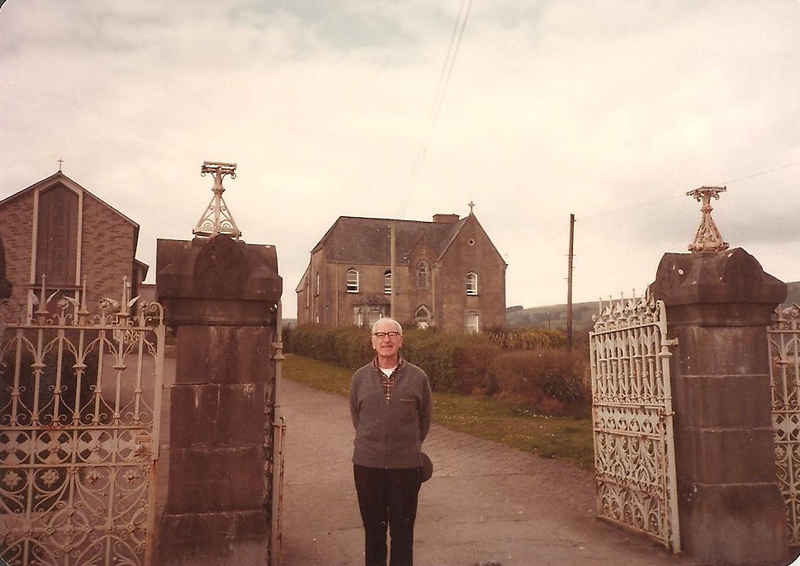 When my parents visited Ireland in the 1980s they went to the chapel and my father saw the marriage record. He also had the opportunity to visit Commonealine. Little did he know that years later, after he died, I would be able to find even more records. A few years ago, some church records became available, for a fee, at The Irish Family History Foundation. I was able to find baptismal records for both Larry Ryan and Johanna Roche, plus the 1841 marriage record for Johanna Roche’s parents. 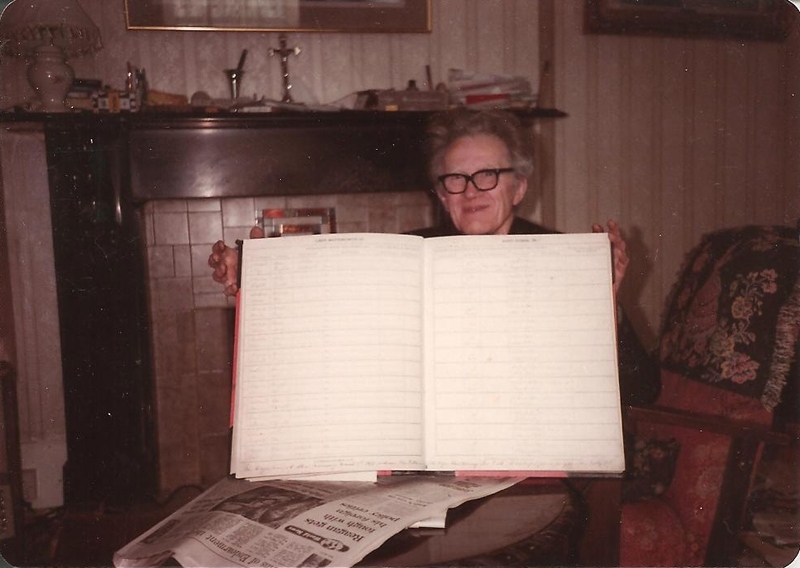 The Pastor of Doon holding the Ryan-Roche marriage record. Turned out, they weren’t baptised in Doon, but in Kilcommon parish. Johanna lived in Bahagha, not far from Commonealine, and Lawrence lived in Foilinefingoe, Upper Turraheen, about 5 miles from Commonealine. The Ryans and Roches lived in a remote mountainous area with many hills and valleys. Commonealine (Cuimin an Fhaill) means the commons of the cliff or the hill of the common land. Foilinefingoe (Foileen na Finoga) also meant cliff, but I don’t know the rest of the meaning; this townland was in a more mountainous area of the county than Commonealine. Bahagha? I’m sure it has some meaning, but I have no clue what it might be. The Ryan part of the book is almost done, at least the first draft. Next on the list – the Colberts. They were the first of the family to arrive in New York, just before the Irish famine. This Saturday I’ll be at the Hudson Valley Family Fest at the Dutchess Stadium with others from the DCGS. Next week – back on track – I hope. I plan to work on the Ryan family and revise their story, then go through pictures and illustrations for the book.